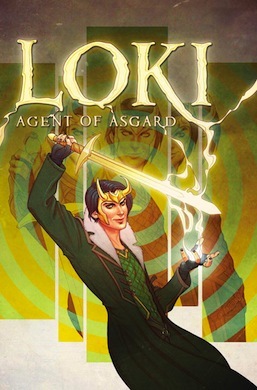 In this post, from Marvel Comics: Loki: Agent of Asgard #1 and from Vertigo: Fairest #23 and Trillium #6. Rejoice Loki fans! Straight out of the pages of Young Avengers, Teen Loki (formerly Kid Loki) got a job working for the All-Mother, a triumvirate on Asgard who have Loki trading good deeds in order to have his more evil stories erased from Asgardian memory. You may recall that before the events of Young Avengers, Loki died as a villain and was reborn in a newer and younger body complete with a guilty conscience and a desire to right his wrongs. This is exactly what he does in this very first issue of his brand new solo series, the arc of which is hilariously entitled “Trust Me” despite the first page featuring Loki literally stabbed his brother in the back. And yes, in this instance I have used the correct definition of literally. Psh, what do you take us for, a website not devoted to the written word? This opening issue is basically one giant story of brotherly dysfunctional love and has Loki moving from his time with the Young Avengers to the adult Avengers, including Thor (obviously), Black Widow, Hawkeye (who is confused as to why Loki looks so One Direction-y), Iron Man, Captain America, and Bruce Banner/The Hulk. Don’t worry, the humor that made you love Kieron Gillen’s Loki is still here and is especially prevalent in Loki’s narrative, in which he directly addresses the audience with witty lines like, “Now, I know what you’re thinking: Why am I falling to my death while a man who makes terrible life decisions shoots an arrow at my face?” And if that doesn’t excite you, in the next issue LOKI GOES SPEED DATING! Fairest is halfway through it’s six-issue arc of the Cinderella-centric story “Of Mice and Men” — that’s issue three if you can’t do math — in this, the first arc to crossover with the events happening in Fables. Which might explain why this story is so much more enjoyable than the rest of the stories in this supposedly female specific series. Probably because this is the first arc to actually deal with women and solely women as promised. You know, the initial point of this series that somehow managed to take 21 issues to finally find its stride? The main exception to this rule has been that dark Beauty one-shot (Fairest #7) by Matt Sturges which I still can’t get out of my head even though I read it back in September of 2012. In addition to finally finding out where that frame story centered around the mice turned Coachmen in the original Cinderella story is going, we also get to see some more familiar faces. Cinderella’s Fairy Godmother is in grave danger (the King’s Men are summoned to assist since they did put Humpty Dumpty back together and are notoriously good with head wounds) and Cinderella has traveled to India where she is being hunted by an old foe with a bit of a grudge. 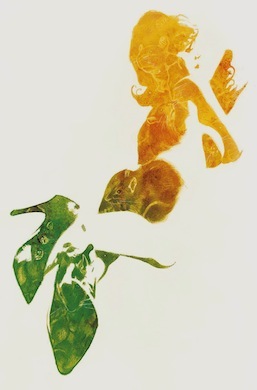 She also meets her old friend Ramayan, AKA Rama: the seventh avatar of the God Vishnu in Hinduism. Finally, a blue avatar who has the distinction of not being a kitty person. When we last left our star and time-crossed lovers Nika and William, they had swapped bodies with much less shenanigans than we’ve come to expect from the body-swapping trope. William is stuck in 3769, having regained his original memories and a definite need to find Nika and make things right, although he definitely gets much less page time than his female counterpart. 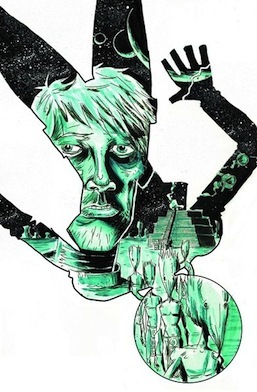 Jeff Lemire continues to play with his layout in their intersecting and mirrored stories, although it’s pretty difficult to read in digital versus physical format. Do yourself a favor and definitely read a copy you can actually hold if possible. Nika on the other hand is trapped in 1921 (albeit an alternate history 1921 complete with airships) and is currently inside a mental institution for her recent ramblings about being someone else from the future. The issue itself opens with Nika’s tragic back story (think Gravity) and will give you all the feels. As Nika recalls her mother telling her the last time they’re together, “My father used to tell me we were all made of stars. That we each had one inside us and when we die, that light goes up and mixes with all the other stars. That way we never have to be alone. ‘Cause no matter what happens, we all end up together.” To which Nika’s voice over sadly responds, “My mother’s last words to me were a lie. Because after that I was alone. All alone. And I have been ever since.” Crying so hard right now! AMC, Seth Rogen and Evan Goldberg are Developing a “Preacher” Television Series!